Twelve years after launching this fresh OPØHQ callsign for UBA HQ, I thought it was time to give it another go myself. 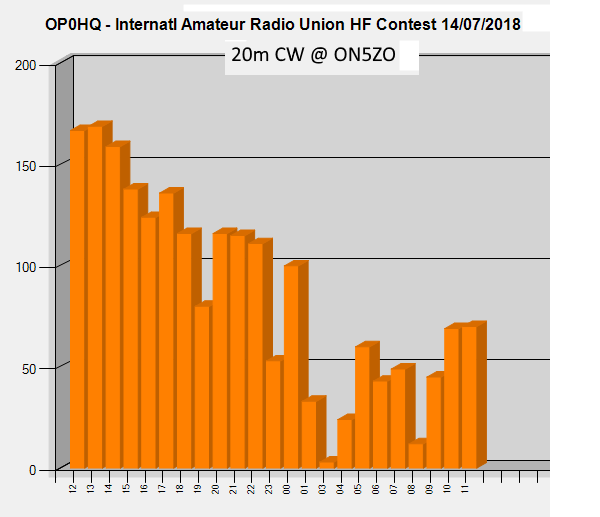 Propagation does not favor SOAB, which is my preferred operating style, and there is no SBxx in this contest. So I offered my services to the UBA for this event. My band of choice was 40 CW with 20 being my second choice but all in all I was glad with the assigned 20 CW. I wanted to put down a good result so I started thinking of a second antenna to fill the voids in the yagi pattern. I did A LOT of thinking and although less than the thinking, I performed quite some building too the week before the contest. In the end I had to scale down because my antennas wouldn’t stay up. See: Drought renders screw in anchors useless. And also because modelling made me conclude that it wouldn’t be worth the effort. There is a more detailed post to come about this. WX was good although very hot. Minor risk of thunderstorms – it wouldn’t be a summer contest otherwise – but no real threats. In the end that didn’t cause a problem at all. Setup was done on Friday and I could test the dipole and the stackmatch. That too worked right away but when I came down from the shack my wife was talking about a beeping alarm on the freezer in the kitchen. It’s a three year old model (the freezer, not the wife) and this never occurred before so it had to be something with the additional dipole. I checked and indeed: only a problem when the dipole was engaged. No problem when only using the yagi. Classic solution: pull freezer away from the wall, add a few ferrite clamp-ons to the power cord (which shortened the cable which makes putting it back in place a pain between kitchen cabinets), plug AC power cord back in and test again. Alarm gone. Hello EMC compliance testers: forget your fancy anechoic chambers; just bring your stuff here and if it still works when I’m playing on the radio, it’s fine. And if your crappy designed stuff causes QRM on the HF bands: I sling a mean sledgehammer. There were some /DL stations on 20 testing their WRTC 2018 setup. They were all very weak during daylight on Friday noon. More spotted but I could only hear three of which I logged two. They gave me better RST than I could give them. The first half of the contest was pretty fast. Then it collapsed like a poorly baked soufflé. Around 1920 utc I did a S&P scan of the band. I encountered a lot of Y8** WRTC stations and this time they were S7 and easily worked. Working one after the other was almost as fast as running. There were some other HQ’s in between so I managed to log another twenty multipliers too. After that I could go on running for another while, much to my surprise. But the inevitable moment still arrived: the band almost died from here with my setup. I was off the air one and a half hour at night for a power nap. I planned and hoped to go 24/24h but the rate was gone, RBN showed the band did not support propagation too well, everything in the bandmap was gray and what I heard was already in the log. At the peak of the cycle you can probably go on but this time is was just too slow. Too bad everything that followed in the second half of the contest was slow and boring. I was back on the air well before sunrise. It was not so much the poor propagation since the band was quite good given the known circumstances. It was just a lack of people to work. By that time I had already worked 1500-1600 QSO on one band in one mode. That might have something to do with it too. Maybe everyone in the contest doing CW already had OPØHQ in the log? Total USA 648 or 31.75%. Almost one out of three contacts from the US of A! Total JA: 55. I don’t know how to assess this number. Only 204 Russians (UA + UA9 + UA2). That’s only 10%. I think that’s low. Certainly compared to other contests. Some semi-rare DX: A9, FR and V5 and also the usual DX: KH6 (2), KL7 (2), ZS, ZF, J3, HZ and tons of Latin-Americans. Twenty PY’s: probably a record in one contest for me on a single band? I had no real goals for the number of contacts. I just had ballpark figures with accompanying sentiments. Below 1200 would be pathetic. Between 1200 and 1500 is not enough but I could blame propagation. Between 1500 and 1800 would be OK. More than 2000 would make me happy. In the end the 2k mark came closer. Each time I extrapolated the end result from the current rate, I would come short. When the bell rang I had 1992 true QSO and 2041 with dupes included. Not too bad I guess. But always room for improvement. It was fun despite the slow last eight hours. Thanks to the UBA for having me on the team.